Alibaba has just made some bold claims about its cloud computing business. Rival Amazon might want to take a look at what the company is working on. Chinese e-commerce giant Alibaba's (BABA - Get Report) cloud computing business is on track to achieve its goal of surpassing US firm Amazon's (AMZN - Get Report) Amazon Web Service (AWS) unit to become the world's top provider of cloud services, according to the head of Alibaba Cloud. Simon Hu, senior vice-president of Alibaba Group and president of Alibaba Cloud, said China's vast home market plus expansion into countries signing up to the Chinese government's "Belt and Road Initiative" trade development plan, gives the company its confidence. "We have taken on Amazon on all fronts as our benchmark over past three years. Some of our products have already exceeded theirs," Hu told the South China Morning Post on the sidelines of the Alibaba Computing Conference in the Chinese city of Hangzhou, where the company is based. "While market expansion needs to be step by step, the technical capabilities of Alibaba Cloud are as good as Amazon's AWS," said Hu. He had vowed in 2015 to "match or surpass Amazon in four years" in terms of customers, technology and worldwide scale. The division saw its revenue surge by 126.5 percent from US$298 million in 2015 to US$675 million in 2016, driven by the domestic market, where it has a 40.7 percent share, according to Gartner. "The large internet population in China and the country's booming internet economy have given Alibaba Cloud a golden opportunity," Hu said. "That is why we have been the fastest growing cloud computing company for the past several years." The rivalry between Alibaba and Amazon extends beyond their cloud businesses. Alibaba briefly unseated Amazon as the world's most valuable online retailer in US trading on Tuesday, after shares of the Chinese e-commerce company rose as much as 1.3 percent to an intraday high of US$184.46 in the New York morning session, giving it a market value of US$472.4 billion and surpassing Amazon's US$470 billion. The stock trimmed the gain to end the day up 0.6 percent at US$183.12, valuing Alibaba at US$469 billion, while Amazon's shares fell 0.4 percent on Tuesday to US$987.20, capitalizing it at US$474.2 billion. Amazon shares were trading at US$987.15 early on Wednesday in New York. Alibaba shares have surged 109 percent this year as rising spending on online shopping in China drives up profits, while Amazon's stock has climbed 32 percent in the period. On a valuation basis, Alibaba is valued at 37 times estimated earnings, with the multiple for Amazon at 233 times, Bloomberg data showed. Faster earnings growth has enabled Alibaba to close in on Amazon in terms of market capitalisation. Second-quarter earnings for the Chinese online retailer surged 94 percent from a year earlier, while Amazon's quarterly earnings dropped 77 percent. Alibaba will probably post a 44 per cent increase in full-year profit in 2017, while the projected growth for Amazon is 21 per cent, according to Bloomberg. 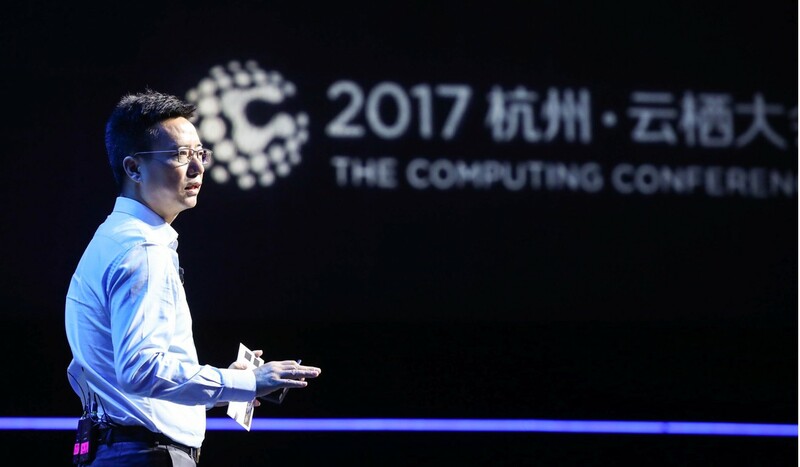 Alibaba, which owns the South China Morning Post, aims to develop its annual conference into a major event in the cloud computing industry. The four-day conference, which started on Wednesday, has attracted over 60,000 visitors. Additional reporting by Zhang Shidong.